There have been problems with the mains on mostly the 550 and 650 machines, it matters not whether the oil is changed regularly, whether it’s for SM – when they go, they go! During 2004-2005, it would appear that engines were built with a lack of end float at the crank. Most of the problems will have worked their way through the system by now. 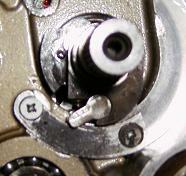 It would further appear that the crankshaft is slightly unbalanced in the way it is held by the two mains. 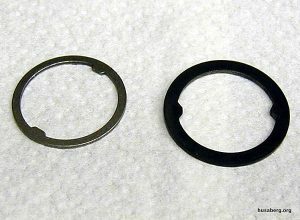 The one on the right is against the flywheel cheek while the one on the left sits some 12mm away – the counter-balancer bearing sits between the casing and the crank. The crankshaft is ‘adequate’ but slight oscillation in an unsymmetrical way occurs. 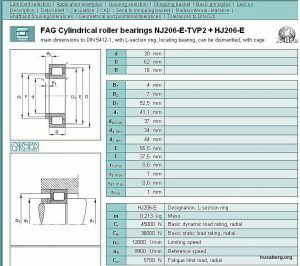 The roller bearings, when fitted can be an improvement but it has been found that sidefloat tolerance is critical. The rollers can catch the ring lip and start chaffing the edge, and the chippings cause spawling and the rest is history! 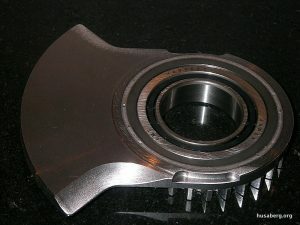 And thirdly, the bearing should only be a slight interference fit into the housing. The bearing should be 62mm dead to -10 microns, while the housing should be 62mm +2 to +11 microns for a good fit. While the crank journal should be 30mm +2 to 11 microns and the ID of the bearing being 30mm and nil to -10 microns. Husaberg motorcycles come with SKF ball race bearings as standard up until 2005, when they changed to a SKF roller mains. Some of the roller mains were reverted to ball race in an effort to cure the failures and just to confuse the issue: some earlier motorcycles have been converted to roller mains! 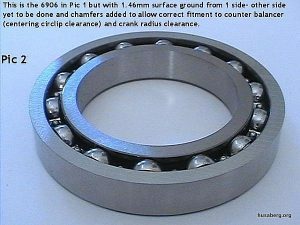 Standard 6206 mains (with 8 ball) can be replaced with the SKF 6206 ETN9 ball main which is the 9 ball bearing – it definitely has a higher load rating than NTN 6206 or SKF 6206. It has 600n higher static load rating (12900n), and 3100n (23400n) higher dynamic loading. (JBS Racing, Ben Ballard, Ausberg. The suffix ETN9 is not a reference to 9 balls. The E suffix stands for reinforced ball set and the TN9 stands for a type of reinforced polyamide cage and the idea is that if the bearing collapses the polymide won’t destroy the rest of the engine but break up. 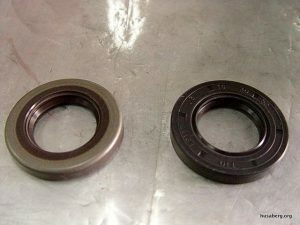 The ball-race bearings can be evil to place and replace (Orangeberg). The NJ206 series bearings has a RPM maximum of 11,000 RPM’s, but only if they are in an oil bath mounted in the horizontal position. 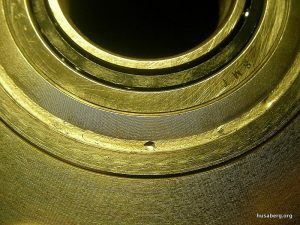 When in the vertical position the maximum for this bearing is 20% less, or 8,800 RPM to be exact, but only if the bearing is at least 30% submerged in oil. 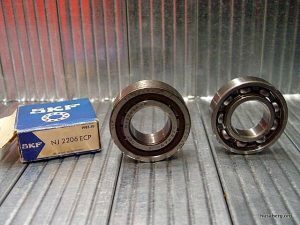 (NSman) Ball-race bearings have a max load factor of 19KN while the NJ206 roller bearings have a load rating of 42KN and should easily be able to handle the crank loads. This became the OEM set-up from 2005 onwards and retrofits to previous Husaberg motorcycles of this engine design. 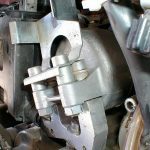 The twin-row counter-balancer should be removed and a wider (20mm roller instead of 16mm) roller bearing fitted with the appropriate spacer made to suit. This is a modification being tried by several race teams throughout the world. 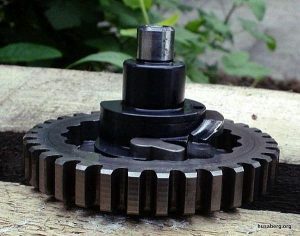 A spacer is generally made to suit the resulting gap OR a single row counter-balancer has been used with the later-day gear teeth design and again a small washer/spacer. First an overall picture must be produced and the story is told as simply as can be. We’ll start with the cams fitted from 2000 up to 2003 inclusive and these were called ’01; ’53; ’55; or ’08. The numbers can be seen right on the tip of the shaft at the chain drive end. Now these were incredibly torquey but relied on late opening and early closing with vicious lift ramps. The cams create massive torque so much so that 4th gear can be used when anyone else would use 2nd. Alas the above is the cost. It causes heavy acceleration peaks in the valve gear. 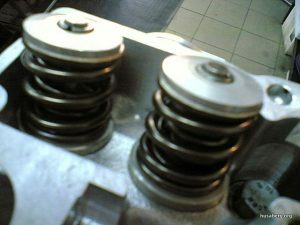 To stop the valves launching into the piston but to make them come back, a very, very strong single conical spring was used. The springs were so strong that the violence of the cam whipping back and forth at especially low (and any other) speeds gave the cam chain a torrid time jolting it about. Unrelated; the springs have a finite life and break so they’re worth replacing with dual spring sets which are far softer and do the same job. Broken valve spring on the left, and guide seal wrecked. The early yellow blades prove inadequate. So the later thick but straight black blade should be used. The chains needed but didn’t get very good support. Looks ordinary, but adjuster has full adjustment. Pressure point has moved down after being ‘modified’ by Weed. The camchain couldn’t cope with the violent pressure of the cam whipping back and forth and the lack of support from the tensioner blade. 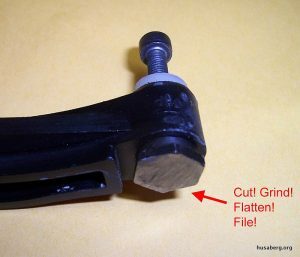 With the black blades being so thick and strong a shorter tensioner is required and the simple way is to snap the alloy knob off the end. 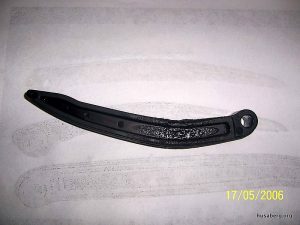 See below… and the tensioner spring may be shortened to put less pressure through to the blade. 50mm down to 30mm. 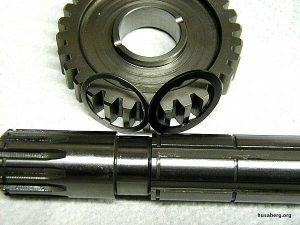 The accelerated lift speeds of the vicious cam gave the cam follower bearings – CFB – that follow the lobes a torrid time as well and these would wear the tiny needle rollers inside and induce large tappet clearances. The valves, specifically the inlets, also found themselves, launched off the top of the cam – ‘bouncing’ is the term – and despite the extra strong springs would, smack back into the seats. This causes the valves to try to sink into the ports by beating the valve’s seating faces into a new shape known as ‘tuliping’. 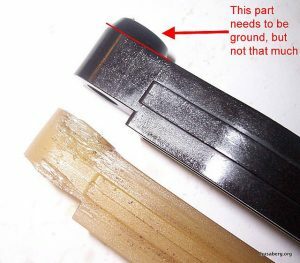 If the valves ‘tulip’ back into the head then the tappet clearances disappear/close up and despite regular adjustments starting becomes poor. So if the valves sink and the clearances disappear we have a new problem! 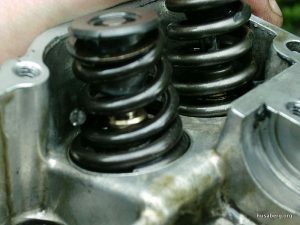 A CFB gains heat as it lifts and lowers the rocker arm under extreme pressure but when it hits the base circle of the cam we would normally have looseness in the tappets, oil would wash over and reduce the working temperature. So hot, cool down and repeat. Alas with no clearance the bearing breaks down due to heat and lack of oil – it never got a rest and never cools down! The Inlet CFB would go due to tuliping valves and the exhaust due to poor maintenance and the most heat to deal with. Conclusion: If you change the cam to a post 2003, the valves get an easier time, so the follower bearings get an easier time and with the aid of a later CTB so does the chain! There are now softer dual valve spring sets available that match that softer cam etc and make life even easier still for the valve train. All this means that if you do all this, you needn’t upgrade those early rocker arms (8mm pins) so you save money! The comments for each part below are taken in isolation and for use with the original cam and springs etc etc. This is for motorcycles up to 2006. Wears very quickly. Aluminum shavings in oil: Probably the chain wearing against the water outlet in the head. 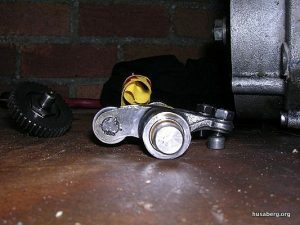 In the above photo, the shiny chain is the standard camchain (2002), and the dull one is an early Husaberg H/D. After 2 seasons of racing, the shiny one is absolutely shagged! Note how the pins are like 3mm out of synchro! The motorcycle came (from 2006) with D.I.D as standard. Then other chains started to be found. New chain vs an old chain… measured from the beginning of the boss on a link to the boss at the beginning of the 31st link. 64 link chain for a 400. 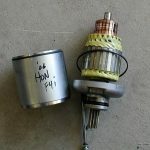 This should however help anyone with a 501/550 chain as well as the 650. Virtually the full width of the boss out in wear! 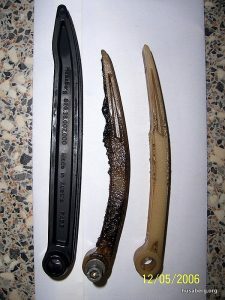 An upgrade for 2000-2002 is the Timing Chain slipper (tension arm) 800.36.002.000. Stepped Bushing (requires modification) 800.36.002.050. In the diagrams below are the early yellow and then the banana black blades, both of which are now superseded. The 2003 is more arched up toward the upper timing sprocket. It uses all the same hardware as the old stirrup, but is keeping the chain far from the water jacket. The steel push bar pairs perfectly. It was upgraded in 2005 for a better supporting pivot screw and nut. 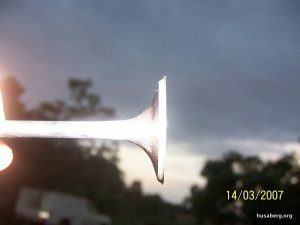 When fitting the later blade, the shoulder can stay on but a deeper bush is required. The alternative is to file the shoulder off and put the shoulder of the bush against the head. There is then only enough thread on the other end for the nut (but no washer). However, given the work/task that the nut has to do it will be perfectly ok! The blade is now positioned perfectly for the chain run. If fitting to a 400 or 470 the later blades are long enough to clip the top of a gear so remove 3mm from the tip (Husabutt). The 2001’s were made of alloy, and if made in aluminum, it’s trash… Replace with the hard steel. 2002’s were fitted with either steel or aluminum, 2003+ = steel. If changing to steel, shorten the bolts or they go through the thinner cam wheel and impact the head (44104). Dual straight valve springs are used from a KTM 450SX. Kits are available from Kibblewhite Precision Machining in the United States. The kit code is 96 – 96031. This is for all 2001 and 2002 Husaberg motorcycles with Rocker Part No: Intake: 200 281-01 and Exhaust: 200 283-01. An upgrade is VITAL or continual replacement every two years of average use (as a precaution) and still using your original parts. 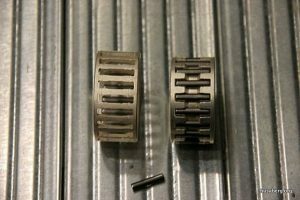 The factory modification was to reduce the pin size from 8.0mm to 7.6mm for 2003+ and this used a smaller needle rollers. This means that all 1999-2002 rockers can’t be updated as the rocker arm holes are of course too big! They must either have (more of the same old, same old) new follower bearings fitted or a complete replacement rocker arm assembly to the later rocker arm with it’s 7.6mm bearings. 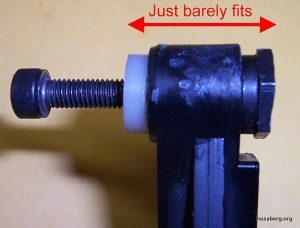 You can buy the complete arm or save your old tappet screw and locknut to save a little. 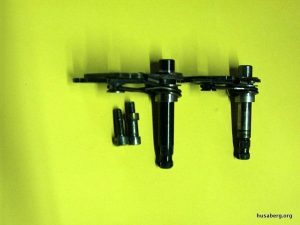 For 2004, all Husaberg heads came with the smaller valves – 35/30 (as opposed to 37/30 in the 470+) and now share rocker arms with the later (see ++ below for old larger arms) model KTM Part#: Intake 590.36.060.144 and Exhaust 590.36.061.144. As mentioned in ‘tuning’, the inlet valves on all 470cc+ engines were 37mm and set wider. The 400 had the follower problems, but the rocker arm size of today’s motorcycles is still OK for it as it ran the 35/27 head. 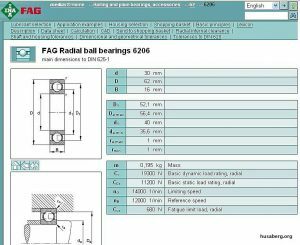 Follower bearings need an end float of between 0.25-0.30mm. This can disappear when punching the edges of the pin so be careful! 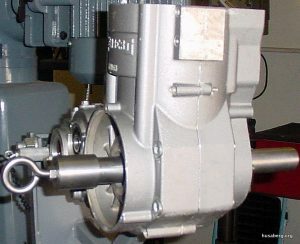 When operating the manual decompression on the electric starter, the point of contact is off center line of the decompression shaft. The rocker arm therefore forces the decompression back closed and your hand starts a fluttering motion with each turn of the engine! 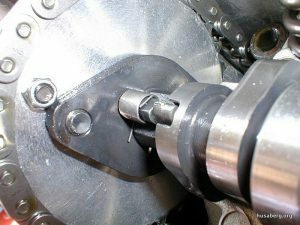 The answer is to file a 45 degree edge to the shaft and this makes the contact point on the rocker arm directly under the middle line of the decompression shaft. It will now decompression the engine as you wish it too! In the above photo, the dark area represents the 45 degree edge filed. It means that the “half-moon” is more on edge and isn’t forced back against the cable. The ‘edge’ is about 2.5mm wide. The difference between them to look at? The old one has the end profile of ‘a boat from above’ and is symmetrical, and a ‘D’ profile where the return spring will slip onto. The latest one has the end profile of ‘a dutch clog from the side’ and there is a single hole in the end profile. The spring sits in a gulley in the arm and the base of which is still a letter ‘D’. The counterweight designs do differ but is too hard to explain! 2004 Husaberg cam with latest decompression lobe. Note how close it is to the front compared to old. This was particularly bad for machines through from 2001 to as late as 2003 but continued through to 2006. 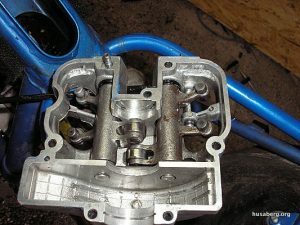 Essentially, the decompression lobe would wear down and not lift the exhaust valve the .040″ (1mm) to release some compression while the engine turned under cranking. There was also the problem that the lobe return spring would be either weak or unwound which equalled “ineffective”. This meant the engine was trying to fight full compression and partial cure at the time was to add a ‘blob’ of weld onto the decompression and then re-profile. 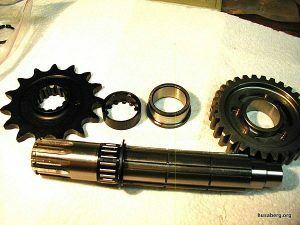 In 2003, Husaberg produced a new camshaft for the 650 and de-comp lobe (200 306-01), they produced another cam for the rest of the range but omitted the fact from the Husaberg Parts Manual. The new cam profiles appear to make life easier for the valve train. It’s easier to follow by reading through a 2004 Parts Manual instead of a 2003! In 2004, everything got new part numbers and a new cam again for the 650. The decompression lobe code is now: 590.36.016.000 and is a complete cure for an ailing engine (Ady). The later inlet valves were shortened by 1.25mm/0.050″. 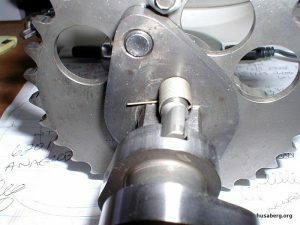 The collet groove moved equidistant down the stem thus the valve spring is further compressed by 1.25mm on later models. All cams up to 2003 had a viscous ramp that made the valves bounce as well as tulip. The cam was changed for 2003. Always rebuild with the later Cam coded ‘000’ in the parts manual. Important Note: Don’t mix these sets of parts! Read the Whining Noise/Racket section below. The auto de-compression sits in the exhaust cam lobe on the underside and suffer from rapid wear on leading edge. the answer is to buy the latest decompression which has an end profile like a clog. This was for machines through from 2001 to as late as 2003. 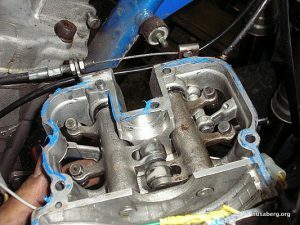 Essentially, the decompression lobe would wear down and not lift the exhaust valve the .040″ (1mm) to release some compression while the engine turned under starting. There was also the problem that the lobe return spring would be either weak or unwound which equalled “ineffective”. This meant the engine was trying to fight full compression. 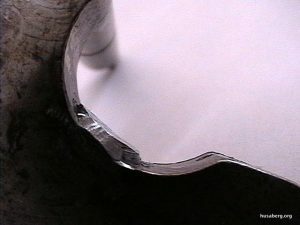 The partial cure at the time was to add a ‘blob’ of weld onto the decompression and then re-profile. If you continually start the motorcycle from cold with the leccy boot, the sprague will ‘spin through’. The whole system (battery, starter, sprague) was beefed up for 2004 and no more problems. Try to start it with your foot and only when warm go to the leccy boot. However the original WILL work if only used sparingly when the engine is warm. It’s called a ‘restarter’ in the manual and that’s exactly what they meant! The noise of it failing is “eeee haaaa”! just like half the cars in Europe in the 1970’s! How it works! (Neil E). 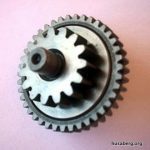 At the same time as the above was being ‘beefed up’ (2003), Husaberg changed the small idler wheel between the starter and the sprague assembly and created the ‘gear wheel torque limiter’. It is designed to slip when faced with a massive surge such as a backfire etc and protect the starter motor. The assembly is built akin to an old drum brake with the friction surface on the inner wheel. The slippage value is between 7 – 15 lb/foot2 (Boss). The gear was modified in 2004 to Part No: 21 800.40.021.100 04 GEAR WHEEL TORQUE LIMITER 04. 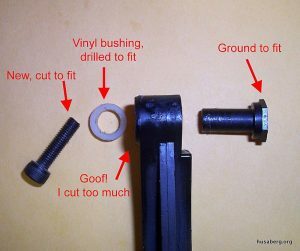 The part can be disassembled and rebuilt with a larger shim: “The one I took off mine slipped at 5Nm, so when you undo the bolt that holds the two halves together there is a dished washer. All I did was to put a 0.015” shim in first then the dished washer, re-tighten the bolt and voila! it now slips at 25Nm! (Sparks). 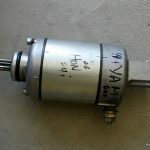 See the discussion on torque limiters. It is often difficult to get the kickstart assembly to stay wound up and ready. The shoulder of the key only juts out 2-3mm and can easily slip inside the gear and then the gear also has say, 0.5mm slack out to the side cover! Before tightening the cover the assembly has slipped off and flown undone. 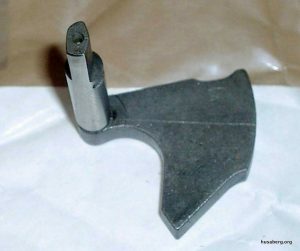 The answer is to add a little weld to the end of the keyhole end so that as much as possible juts out the back of the gear and can locate on the crescent’s shoulder. Noise from left side cover. Must get the correct sprague bearing for your model or they make a real racket! Pre 2003 spragues; #HB250248, post 2002; #HB250273. See this discussion on whining noises. If it’s stamped #130, you have a 2001 engine and need balancer #210-255-01. 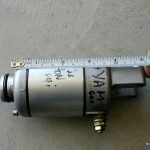 If it’s stamped #145, you have a 2002 engine and need balancer #210-253-01. Some Husaberg riders may find their gearbox is loose and will sometimes whine! Dale (Lineaweaver) yet again knew what to do when he made these gearbox shims to take up the slack. “He made it 0.050″ thick and slightly larger in O.D. than the O.E.M. 0.040” thick disc (JoeUSA). 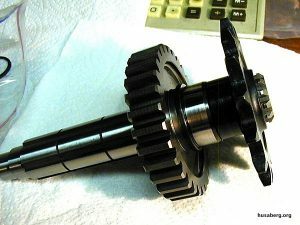 “It was perfect, and in addition to correcting the axial location of the counter shaft gear axial location it corrected the excessive axial clearance of the counter sprocket”. The counterbalancer has gained weight in recent years and to remain reliable, the factory went to two ball-races side-by-side: a kind of ‘duplex bearing’ (2006+). Check out the 2007 Parts Manual for this upgrade. However there is concern about the whole crankshaft assembly and it’s best to read page 4 and Engine Hardware comments. 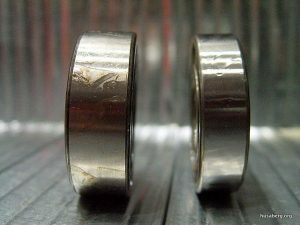 The bearings can be very expensive to replace so see Ausbergs answer below! 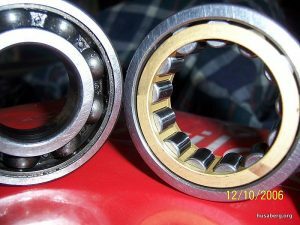 The bearing can fail on the 501 engines whereas the 400 gets away with it’s single row. 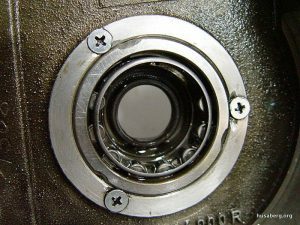 But the factory solution is for the counterbalancer to contain two rows of ball bearings each at 6mm wide: a kind of ‘duplex bearing’. Check out the 2007 Parts Manual for this upgrade. The double row are infact two 9mm bearings ground down to 6mm. 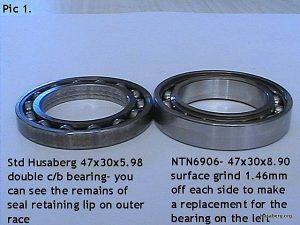 The cost of replacement for the originals is prohibitive so Ausberg simply ground a pair of 9mm bearings down by taking 1.5mm from each side. The oil seal lip has been machined away. Note the two tiny screws (above). 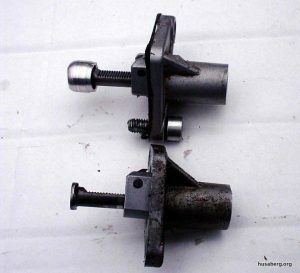 Because the newer spring makes the shifter taller, I initially tried a longer screw and a brass collar (on the right in the photo), but it was too tall and hit the underside/outer edge of the clutch gear teeth. So I had to keep the original screw, narrow the head down to just the width of the dowel. Clutch center gets grooved. A new one means easy changes again. 100% cure. We have yet to check the 2004> generic head. Find TDC using “dead-stop” method. Warning: 8d out on my motorcycle. Here’s how to find ignition timing using a strobe. The single bearing counterbalancer was replaced with a double bearing counterbalancer in late 2002. Counterbalancer failures were experienced on some 650’s and a lesser amount of smaller displacement engines. 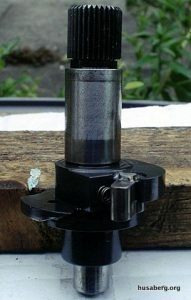 A counterbalancer assembly is available to upgrade to the double bearing version. Included are: Counterbalancer, bearings, circlip and shim. 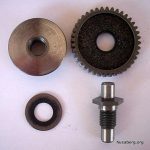 The 2003 counterbalancer cannot be used, as teeth on the counterbalancer sprocket have a different mesh.